I wasn't going to admit this, but when I first read the description of this book I thought it was actually about Michael Morpurgo, needless to say it isn't. It was however inspired by a true story (details at the end of this post). 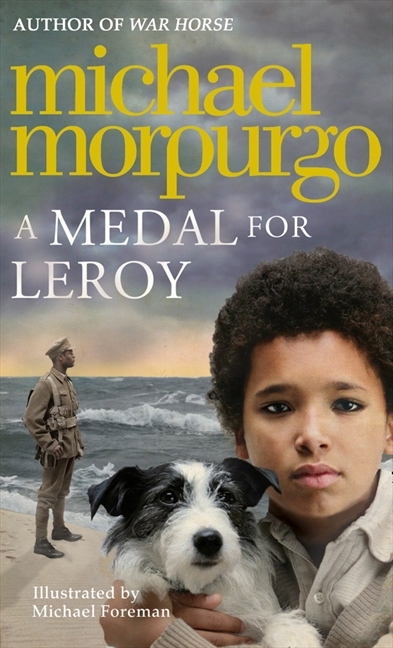 As with a number of Morpurgo's books, the story starts in the present day. We then go back in time and find out how our characters got to this point. Michael grew up knowing all about his father, who was killed when his plane was shot down over the channel in WW2. He knew that his father was adopted by Auntie Pish and Auntie Snowdrop when his parents were killed in the earlier war. When his Auntie Snowdrop dies, and Auntie Pish is in a nursing home he receives the framed photo of his father that stood on their mantle piece. What he discovers hidden within the frame will change everything he knew about his family history. This story beautifully and honestly describes a time in history when the colour of your skin meant that you were treated differently. It didn’t seem to matter that these men were willing to fight for their country; their acts of bravery were not acknowledged in the same way as white soldiers. As I said earlier, this isn’t a true story, but was inspired by one. The story of Walter Tull, the first black combat officer in the British Army. He was recommended for the Military Cross (a medal for officers who show gallantry fighting the enemy), but he was never given the award. Walter Tull was a British soldier, but there are more examples of this injustice in armed forces across the globe. There is some information about Walter Tull and other black soldiers in the back of this book. Michael Morpurgo once again writes a beautifully simple story about something big. It is what he does so well. I have said before that authors like Michael Morpurgo may need to be introduced to readers, as his books may sit on the shelf when the choice is between him and the new Diary of a Wimpy Kid. But when they read a Michael Morpurgo novel all bets are off, because I know from experience that readers want to read EVERYTHING he has ever written, and that is especially true for boys.